Butch: You know, when I was a kid, I always thought I was gonna grow up to be a hero. Sundance: Well, it’s too late now. Butch: What’d you say something like that for? You didn’t have to say something like that. Newman and Redford. Butch and Sundance. We know those faces. Those beautiful, almost ridiculously handsome, rugged, wrinkly-eyed smiling, goddamn charming faces. And those eyes – those twinkly and soulful eyes – these guys were made for the cinema beyond their physical beauty – they said so much with their eyes and in such different ways, and with a power that is, like the western anti-heroes they are portraying, instantly mythic. 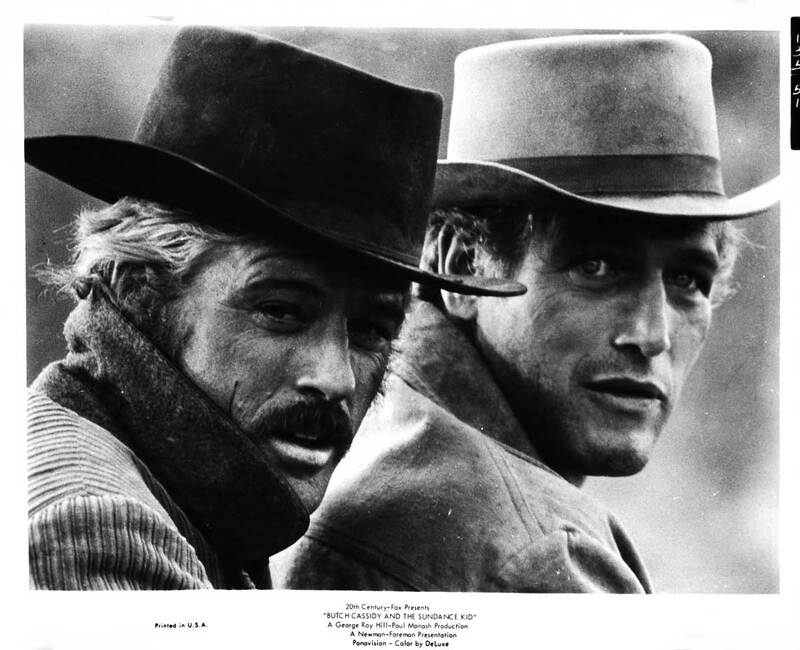 In fact, it’s Newman, Redford and William Goldman that made the men – Butch Cassidy and the Sundance Kid – truly mythic – the real-life pair, not a household name before the picture, could have been forgotten by the mainstream world had the movie, Butch Cassidy and the Sundance Kid, never been made. But no one will forget them now. And there’s something ultimately touching about that. These two guys living and dying as the last outlaws during the remnants of the Old West, men who were up against the modernization of the world (while taking advantage of it – until they couldn’t outrun it), are emblazoned in our minds because of technology – the movies. And not just the movie made about them, but the big screen mythology of the western outlaw that was occurring in their own time – Edwin S. Porter’s The Great Train Robbery came out in 1903 – five years before Butch and Sundance ended their lives in Bolivia. I wonder if they saw it? I can only imagine the possible glee (or anger – and screenwriter William Goldman thought of this too) on their faces. Even with the few photographs of the real life Butch and Sundance, I picture them sitting in the theater as Newman and Redford, smiling and elbowing each other, or angrily objecting (young Sundance, in fact, then Harry Longbaugh, as cited in Thom Hatch’s wonderful, The Last Outlaws: The Lives and Legends of Butch Cassidy and the Sundance Kid, wrote to a newspaper to set the record straight about his undeserving status as “one of the most dangerous outlaw in the West: “I read a very sensational and partly untrue article, which places me before the public not even second to the notorious Jesse James…”). There they are, in my mind, taking in the same kind of crime they had committed, listening to the audience oohing and awing in rapture. Think of it: Butch and Sundance, looking at that in-your-face medium close-up of Justus D. Barnes as he shoots his pistol point-blank. And the amazement in the audience! To think that one day Butch and Sundance would also be on that big screen – they likely never anticipated that. They too, would get their close-ups. And people would flock to see them. So, yes, I imagine their eyes, whether Butch and Sundance or Newman and Redford (now I am blending the two images – see how mythology melds in your mind?) pondered the thought. And those eyes are lit up. Director George Roy Hill opens the film with newsreel footage resembling Porter’s train robbing revolution, elegiac music playing along. This isn’t just a happy story, we are already warned: this won’t end well. Butch approaches the guard at closing time and asks what’s happened to the old bank. Butch says, rather disarmingly, that it was “beautiful.” The Guard tells him that people kept robbing it. “That’s a small price to play for beauty,” Butch opines. And from that gorgeous line comes the gorgeous intro of … Sundance. Another close-up, another shot fixed on the eyes – this is almost two minutes of Robert Redford playing poker, and we just keep looking at him, and for so long that it feels cinematically daring. Who is this guy? Well, we all know now, but at the time, we are looking at a true star-is-born moment. 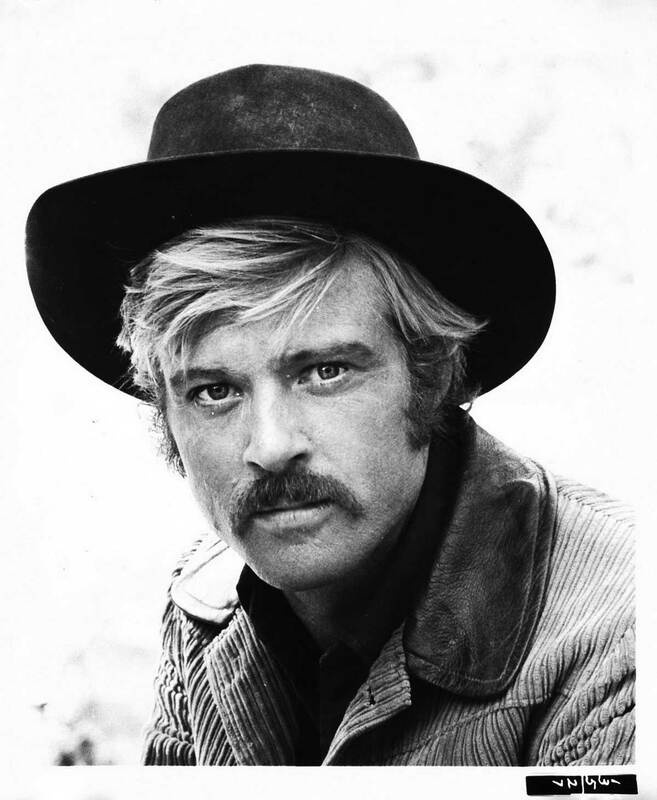 The Sundance Kid will never be forgotten because of this image and because this is Redford as what we know and think of as ROBERT REDFORD (the all caps ROBERT REDFORD). There’s so much mythmaking in this moment that it feels beyond cinema. There’s a reason he’s called a star. Hill insisted on this majestically lit Conrad Hall close-up and to hold this shot at length because he wanted the audience to know that we are staying with this guy through the entire movie. This isn’t just some actor playing poker, some guy who will get shot in the first five minutes, this is one of the two who we will be following, rooting for, and falling in love with alongside that well-established star, Paul Newman. To think that anyone needed convincing of Robert Redford seems almost absurd now, but then he wasn’t a huge star. And so, again, to watch the mustachioed 32-year-old stoically playing poker, hat brim low, eyes piercing the darkness, and thinking of all that Redford will become (not to mention the Sundance institute) underscores how important a film entrance like this was. 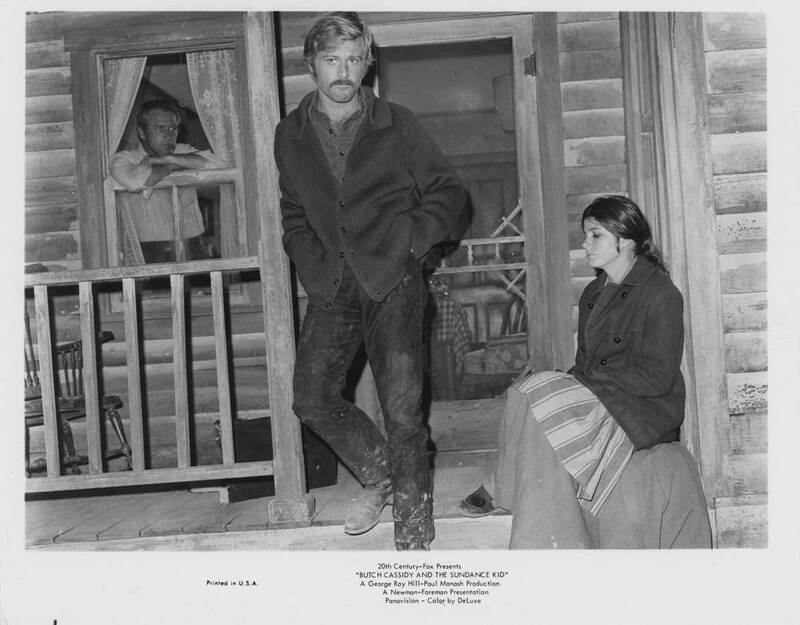 Redford, whom Hill fought for as Sundance (producer Richard Zanuck couldn’t see it – until he watched the dailies and realized how very wrong he was), won out on casting, and the rest, as they say, is history. Sundance: What’s your idea this time? Butch: Bolivia. That’s a country, stupid! In Central or South America, one or the other. Sundance: Why don’t we just go to Mexico instead? Butch: ‘Cause all they got in Mexico is sweat and there’s too much of that here. Look, if we’d been in business during the California Gold Rush, where would we have gone? California – right? Butch: So, when I say Bolivia, you just think California. You wouldn’t believe what they’re finding in the ground down there. They’re just fallin’ into it. Silver mines, gold mines, tin mines, payrolls so heavy we’d strain ourselves stealin’ ’em. Sundance: You just keep thinkin’, Butch. That’s what you’re good at. Butch: Boy, I got vision, and the rest of the world wears bifocals. This Jules and Jim situation was somewhat modern in movies in 1969 and was certainly modern, indeed radical, back in the day, as Etta Place really did live with both Sundance and Butch, and likely aided in at least one of their robberies. Looking at a picture of the real-life Etta and Sundance, he suited up nicely, looking slick, and she, so very pretty, wearing a beautiful dress and a watch pendant Sundance gave her, with a soulful look in her eye, you wish there was an entirely separate movie just about this fascinating woman (And there is! There are two TV movies about Etta, one with Ross, I’ve just learned of, that look to extend the mythology – Etta and Pancho Villa? Not sure if they are any good but I now need to check these out – digging to see if there are others…) Ross plays Etta with a warmth and intelligence and some mystery, and you want to know more about her. She’s a lover, but she’s also game, and she’s smart – she sees the end coming and gets the hell out of there. The real Etta took off as well – never heard from again – I wonder how long she lived? What was her life like? How much she missed those guys. Oh, she must have missed those guys. And we’re gonna miss those guys. For as light as the picture plays – that touching sepia toned montage of Butch, Sundance and Etta’s high time in New York City, the music, the smirking banter – we know that this almost unseen force, the super posse, which takes up a good final third of the picture, is weighing down on them. Shot at a distance, the posse is like a machine, emblematic of the future… and the future is the one thing Butch and Sundance cannot shoot their way out of. The amusing refrain “who are those guys?” is funny but also haunting as, really … “who are those guys?” That’s a question many of us could ask when we’re trying to untangle exactly who is at the bottom of it when our lives are suddenly upturned and things are beyond our control. It does read like a condensed novel – and you can understand why Goldman went lyrical with these men – their lives were not just mythic, but incredibly real – they came from hard working, religious backgrounds where the American dream is always out of reach. Both Butch and Sundance watched their parents work themselves to the bone, never getting ahead, and, after attempting backbreaking work themselves, decided – this is not for me. What is the point of this? Working without joy, working without profit? Why do this? Goldman’s brilliance and dedication shine sin the way he subtly added layers of their biography and truth to the story without subverting the flow of the narrative, and you get glimpses of their past in pointed remarks or even double-meaning jokes. At one point Butch says to Etta, “I swear, Etta, I don’t know. I’ve been working like a dog all my life, and I can’t get a penny ahead.” And Etta answers: “Sundance says it’s because you’re a soft touch and always taking expensive vacations, buying drinks for everyone, and you’re a rotten gambler.” Butch quips: “That might have something to do with it.” In Sundance’s poker playing introduction he’s asked the secret of his success: His answer “prayer.” The answer is both ironic and earnest – coming from a religious background, prayer, even if rejected, likely never left him. By the picture’s end, we know they’re gonna die (we know it earlier, in fact, as the film’s opening newsreel footage reads “The Hole in the Wall Gang, led by Butch Cassidy and the Sundance Kid, are all dead now …”), though we’ve been so charmed throughout the picture, and the chemistry between Newman and Redford that we may have forgotten. 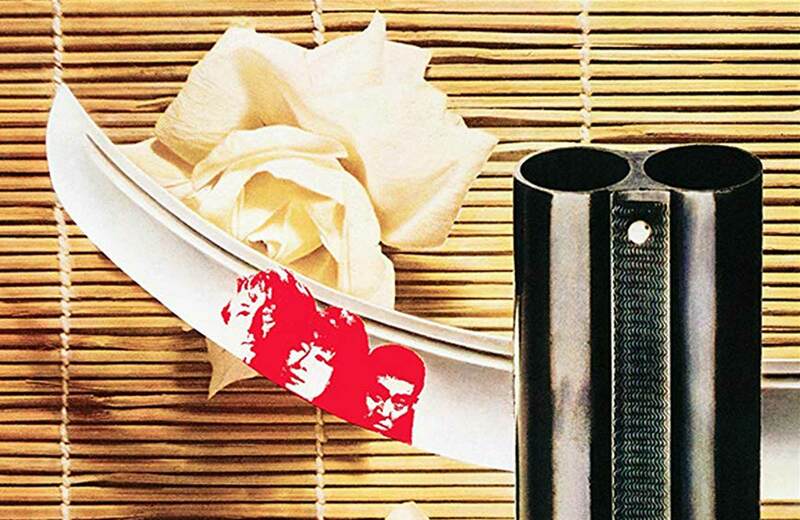 In a beautiful circular fashion, the movie opens with the legend – the film footage in sepia- and closes with the legend, the sepia freeze framing Butch and Sundance as they choose their fate in a spectacular kamikaze fashion. By allowing the soundtrack of the gunshots to continue over the frozen image of our heroes, Goldman and Roy Hill acknowledge the historical that these guys died (exactly how is up for question – they may have fulfilled a murder/suicide pact), but grants them immortality. We did. We do. And we will keep on making a big thing out of it.